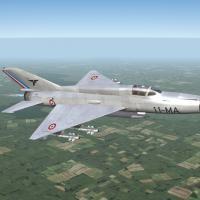 I modded the stock MiG-21SM from SFP:E to make it look like a fictional fighter for the french air force. After the retirement of the Farandole II, several french fighter wings got the Mystere IVA. Complaints about lacking engine power and fire power led to the development of the Sagette, which was a more versatile and powerful fighter, easy to fly and and with reasonable armament. This plane entered active service in 1971, replacing the Mystere IVA. This plane was also able to carry the new R530 IR and radar guided missiles, which gave the plane even more firepower. 1. Drop the the folders into your Strike Fighters mod folder. Also big thanks to Spinners for his decals.